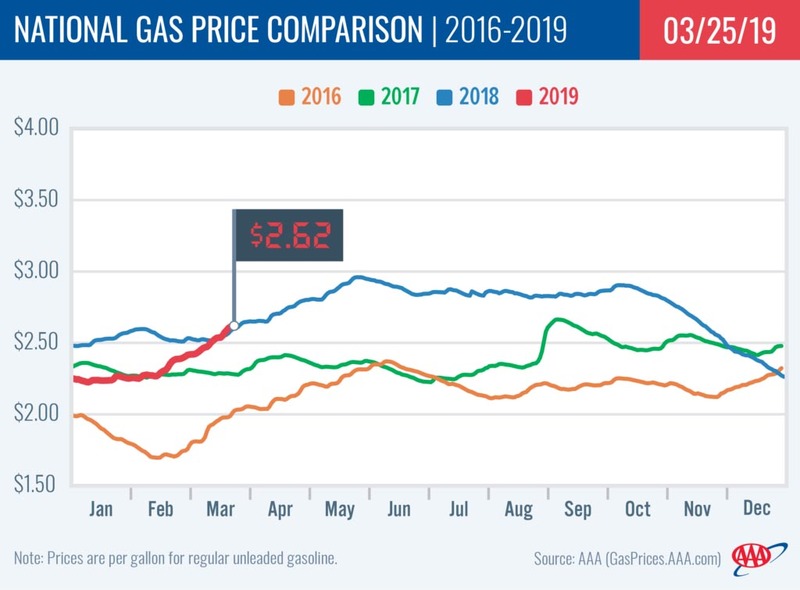 “State gas price averages are very similar to a year ago give or take a few pennies, which means some motorists are paying among the most expensive averages seen this time of year in the last five years,” Casselano stated. This week, Utah ($2.34) carries the cheapest gas price average in the country while Wyoming ($2.40) ranks as the 7th least expensive. This is a vast juxtaposition to last year when both states routinely ranked as some of the most expensive state gas price averages. [320left]This winter, most of the Rockies region has seen significantly cheaper gas prices likely due to strong inventory levels and lower demand. Year-over-year, gas prices are as much as a quarter cheaper in the region. However, this isn’t expected to be the case throughout the spring and summer as gas prices are expected to return to the more expensive levels of last year. 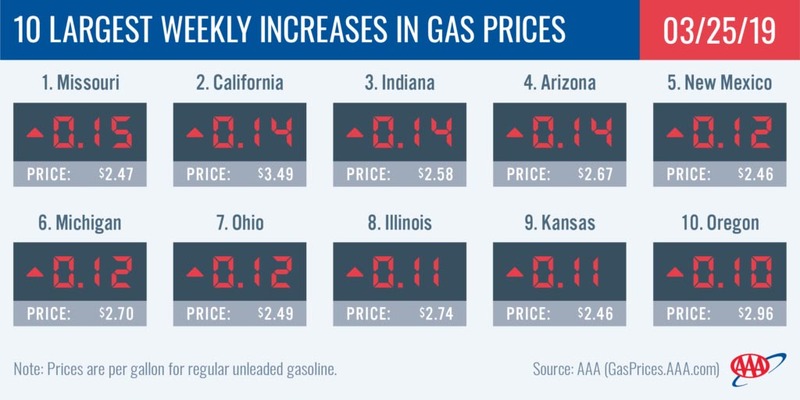 [320right]Even as gas prices continue to increase, Alabama ($2.36), Mississippi ($2.37), Arkansas ($2.37), Louisiana ($2.38), South Carolina ($2.40), Texas ($2.41) and Oklahoma ($2.43) carry among the cheapest averages in the country. EIA data shows that the South and Southeast had the largest draw in stocks in the country with 2.4 million bbl, dropping totals to 83 million bbl, which is the lowest reading since the end of November 2018. Stocks have drawn sharply from February’s 90 million bbl reading to today. The consistent decrease since February — which is partly attributed to exports — has caused gas prices to increase throughout the region. Pump prices in the West Coast region are among the highest in the nation, with most of the region’s states landing on the nation’s top 10 most expensive list. California ($3.49) and Hawaii ($3.40) are the most expensive markets. Washington ($3.07), Oregon ($2.96), Nevada ($2.89) and Alaska ($2.83) follow. Arizona ($2.67) is the only state in the region that dropped from the 10 most expensive markets list. All prices in the region have increased on the week, with California (+14 cents), Arizona (+14 cents) and Oregon (+10 cents) seeing the largest jumps. At the close of Friday’s formal trading session on the NYMEX, WTI decreased 94 cents to settle at $59.04. U.S. stock market losses dragged oil prices lower despite new data from EIA that revealed that total domestic crude inventories fell by nearly 10 million bbl to 439.5 million bbl. The larger-than-expected drawdown could be a sign of higher crude prices in the near future in light of crude export sanctions on Iran and Venezuela and OPEC’s 1.2 million b/d production reduction agreement which is in place with other major global crude producers through June 2019. Crude prices could rise this week if there is another major drawdown. Pump prices will likely follow suit as the country enters the late spring and summer driving seasons.